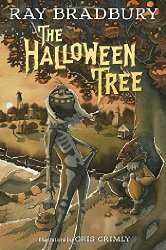 In The Halloween Tree, master of fantasy Ray Bradbury takes readers on a riveting trip though space and time to discover the true origins of Halloween. On a race through history, 8 boys must learn the secrets and origins of Halloween night in order that they might save the life of their friend, who has been stricken ill on Halloween. Ray Bradbury weaves an imaginative story that creates a rather simplified but no less interesting history of Halloween night. With his usual imagery, Bradbury really creates a story with eerie and sometimes scary nature that is Halloween night. That was my original review of The Halloween Tree from a couple of years ago. Having not read it since, when I re-read it for my book group recently I assumed that this time would just be a refresher for me on the book. I was so wrong. Somehow, this time around it was like I was reading the book for the first time. Bradbury's language spoke to me in a way that it definitely had not previously, leaving me nostalgic for my own youth and the excitement of being a young boy at Halloween, and then sad for how much Halloween seems to have changed for so many kids now. Halloween is nothing like it was when I was younger, which in turn was nothing like it is described by Bradbury in an earlier time, but there definitely seems to be a loss of the magic of the holiday for kids today. I think now more than ever, we could use Mr. Moundshroud to reveal the magic of Halloween to this generation. This new edition has new, appropriately creepy accompanying illustrations by Gris Grimly. I'm always excited to see how Grimly translates the written word into visuals, and he didn't disappoint with this volume. He captures something of the magic in the story perfectly.